tekreplay has no other items for sale. *$35 for 12 months. Minimum purchase required. Storage: 128GB Screen Size: 11.6in. 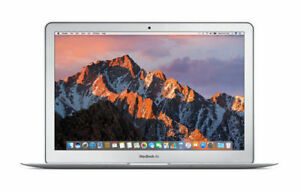 The Apple MacBook Air MJVM2LL/A notebook is power packed with the 5th Gen Intel Core i5 processor for fast performance. Enjoy great viewing experience on its 11.6" TFT Active Matrix LCD display. With a 128 GB hard drive. it lets you store movies games folders and more. You can work uninterrupted through the day with a battery life of up to 9h. Battery Run Time Up to 9hr. Shipped quickly!!! Great seller! Thank you I love my laptop!!! Shipping was fast! Item as described. Couldn’t be happier! Great seller! The MacBook Air was not in working condition, refund was prompt though. Thanks for a real nice laptop. MacBook was more than I expected . Thought there was gonna be lots of searched and dings. But there were very little minor scratches hardly noticeable especially if you put a hard cover on it. No dings what's so ever. It booted up very quickly. Super nice for the price no doubt. Couldn't be happier. Definitely a good buy. For those looking into investing a MacBook I would get one from these buyers. Shipping took 5 days. Packageing could have been better but other than that I love it! The machine physically works great. Everything is fast and works as expected. It's the perfect size for portability. However, the case of the laptop was pretty banged up and the screen was scratched. Although this is the entry model, I am very pleased with the MacBook Air. It Looks and feels great (like almost all Apple products) and has enough Memory and Power if you don't use it for a lot of Video cutting and don't want to have a lot of media on your local device. Great quality, shipping, and packing. The seller obviously cared that the user got the best experience, due to the careful packing and amazing condition of the item. Really the only defect is a small scratch, but that was mentioned. The keys are slightly sticky, but I can feel them breaking in, they get smoother as I type more. All information is cleared and the computer seems like it was never used. I definitely recommend this product and seller.